Looking for a delicious light meal for yourself, or are you having a casual get together with friends? 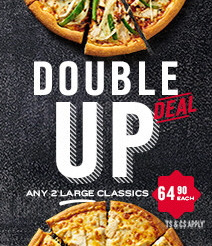 Why not get a great tasting pizza at Domino's and not only enjoy exquisite taste but also affordable prices on all items. 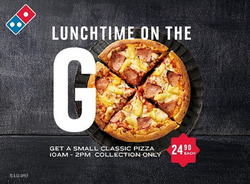 Domino's Pizza is an international pizza company that has swiftly found its way to most South African's tables and social get together events, thanks to its delicious ingredients and flavours making it one of the leaders in Pizza establishments. Domino's Pizza selection includes Traditional (Tikka Veg, Hawaiian, BBQ Chicken, Ham & Bacon, Regina, Feta & Olive and Deluxe Cheesy Margharita) Domino's Epic pizza (Meatzza, Extraviganzza, Pepperoni & Bacon, Caribbean, Chicken Tikka, Chicken Honey & Mustard, Pepperoni, Classic veggie), Domino's Supreme (Bacon & Rib Honey Mustard, BBQ Chicken & Bacon Supreme, Fiery Hawaiian, Texan Fiery Beef, Meaty Supreme) as well as Domino's famous pizza selection. 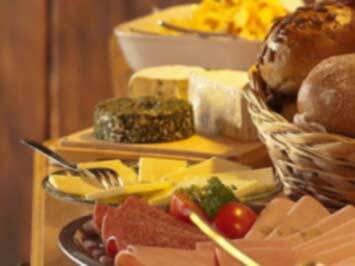 Other items on the menu include chicken kickers, speciality chicken pineapple and Jalapeno, speciality chicken BBQ and bacon, chicken strips, desserts, side breads and refreshing beverages. Domino's Pizza sizes are from small 19cm, medium 23cm and large at 30cm. Domino's Pizza started their journey in 1960 and has since grown from strength to strength. Domino's Pizza is the second largest pizza food chain in the world with more than 13,200 branches across 80 markets. The company charges royalties to franchisee owners and are dedicated to enriching the growth of own companies as well as franchise branches. Domino's Pizza is an international Pizza brand that has several years of satisfying hungry customers looking for something delicious to munch. The menus are available to download and includes a separate Halal menu, visit the a store or order online - see the online store locator to find Domino's branches near you. There is a wide selection to choose from that includes all your pizza classics such as Hawaiian and Margherita down to the Domino's epic and foumous pizzas that includes Domino's Pizza extraviganzza and plenty more. 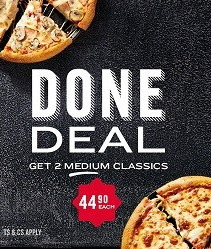 There are always money saving Domino's Pizza specials and something tailored to everyone's taste and Domino'z Pizza delivery service is available for free on orders that exceed R55 and there is no need to worry about late deliverys because the company guarantees a 30 minute delivery time.